Now I'm going to shock you here but CND Shellac in Burnt Romance and I have never really gotten along. I feel like it's gone a step further than a shelf sitter for me, it's virtually lying in a long hibernation on my shelf because nobody picks it. I do believe (and I always say) that it's no coincidence that the colours that we do not like ourselves, are not chosen by others. Let's take Cocoa for example, that was my original unloved shade from back in 2011. I think I may have used it on a colour pop once or twice because I didn't care for it. It was only about a year ago when I did a blog post trying to showcase it a little more that the colour pops from that post went onto my rings with the rest. All of a sudden since then I've had people picking it, I even have one client who chooses it every few appointments. I've really put the effort in to find some good combinations using Burnt Romance, I need to change my 'cover it with Black Pool' attitude and I think with these, I may have just done it! CND Additive in Plum Love. CND Additive in Crushed Suede. 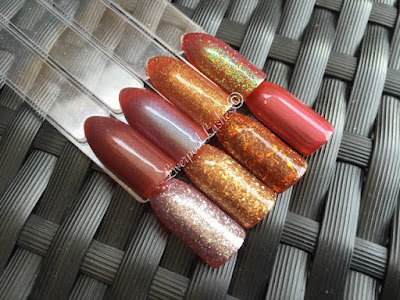 Lecente Stardust Glitter in Neptune. Lecente Confetti Pink Iridescent Glitter. Lecente Stardust Glitter in Constellation. Lecente Stardust Glitter in Starlight. A combination of copper and gold foil. 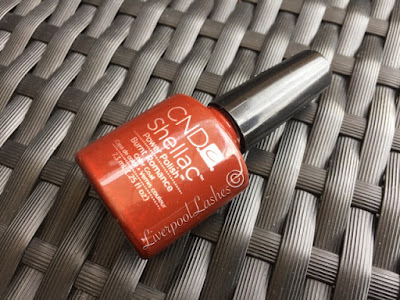 CND Shellac in Hot Chillis. I hope that you've enjoyed this little post and that it's maybe given you some inspiration as to what to do with this shade. One thing is for sure, it's never going to get chosen if we don't showcase them more often and highlight them to clients.